MERCERVILLE, Ohio — Unfortunately for the Lady Rebels, Federal Hocking’s road trip to Gallia County on Monday night probably seemed shorter than the match itself. That’s because the visiting Lady Lancers needed only an hour and five minutes to sweep South Gallia, as Federal Hocking won 25-7, 25-22 and 25-10 in a Tri-Valley Conference Hocking Division tilt. The loss left the Lady Rebels at 1-6 — and 1-3 in the TVC Hocking. Federal Hocking raised its record to 6-2 — and to 3-1 in the league. 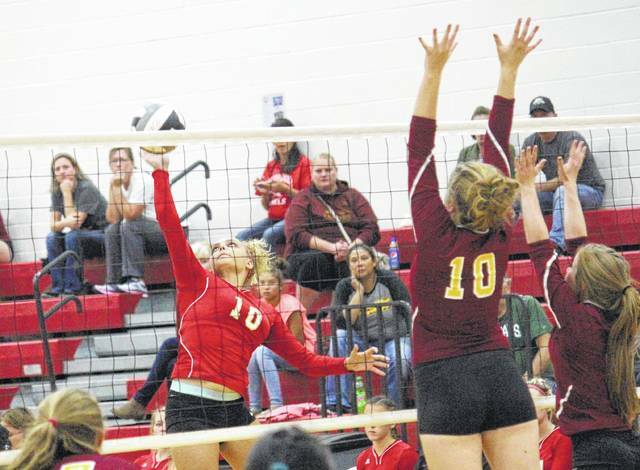 In games one and two, the Lady Lancers never trailed — and rolled to wins of 25-7 and 25-10. All throughout, Federal Hocking took advantage of South Gallia’s errors, whether it be attacking, serving or most frequently hitting. The Lancers also utilized their height against the smaller Rebels, in particular middle hitter Jaylen Rogers and outside hitters Hannah Dunfee, Brittnie Jackson, Paige Watkins and McKenna Roush. In the second set, there were actually three lead changes, as the game stood tied at 1, 3, 14, 15, 16, 17 and finally 20. In fact, the Rebels did battle back from a 14-9 deficit, and took a 16-15 lead by scoring five consecutive points on Lancer errors and an Aaliyah Howell ace. But an Audrey Blake kill for Federal Hocking, followed immediately by a Rebel attack error, gave the Lancers the lead for good for the remainder of the match. South Gallia’s Hannah Shafer served up an ace for the 20-20 tie, but the Lancers scored three of the final four points on a kill by Rogers and an ace by Dunfee — sandwiched around a Rebel net violation. The closest the Rebels got in game three were 3-1 and 5-3 — on kills by Christine Griffith and Rachal Colburn. Colburn collected a pair of kills and three blocks, while Griffith added a block and an ace. Olivia Hornsby set for three assists, while Erin Evans added two. In the opening set, the Rebels’ points occurred on a hitting error, a Colburn block-kill, a net violation, a serving error, a Griffith ace and a pair of Evans kills. The Rebels returned home, and returned to TVC Hocking Division action, on Tuesday against Trimble.